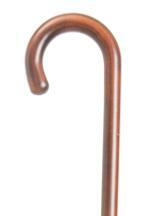 A very traditional, elegant crook handle cane with a smooth, varnished finish. Made from cherrywood with a beautiful grain to the wood. Overall height 92cm (36"). Fitted with a non-slip black rubber ferrule. Ferrule diameter 19mm.